After our visit to the Eric Carle Museum, I want to read all of his books to Arya. 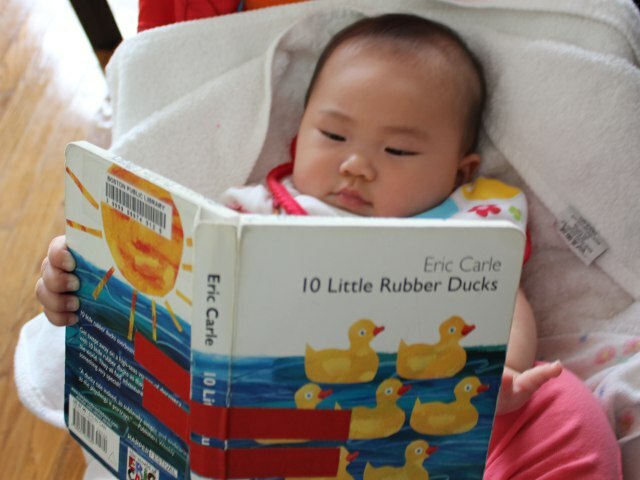 10 Little Rubber Ducks by Eric Carle is one of his more recent titles. My daughter liked the cute display of ten, yellow, rubber duckies on the front cover. 10 Little Rubber Ducks tells the story of a box of rubber ducks made at a factory in a nondescript foreign country. During their journey on a cargo ship the ducks are tossed overboard in a storm and released to drift apart. Each duck drifts in a different direction and readers follow the ten ducks on their short adventures. 10 Little Rubber Ducks is aimed at toddlers and school-age children who are able to learn new concepts through reading books. Carle fits numerous lessons into the 36 page book including: counting from one to ten, the manufacturing process, global trade, power of the ocean, effect of currents, cardinal directions, basic directions, night and day, and the behavior of living ducks. As with his other books, Carle intends for parents to use 10 Little Rubber Ducks to further explain concepts to their children. Illustrations are drawn in a fanciful style with a mix of colors splashed across individual animals and entire backgrounds. I particularly liked the fact that the color and composition of the ocean changed depending on the direction of each duck. Arya liked the page with the bright pink flamingo the best. The hardcover versions relies on a small font placed above illustrations occupying the middle 70 percent of the page with white borders on all sides. The small font makes it a little hard for older adults to focus on the text when reading the book at an angle. However the book’s small size makes it ideal for little readers to hold by themselves. A board book version (no longer in print) contains a battery pack and button used to make the duck on the last page squeak. The hardcover version does not have the squeaking feature. 10 Little Rubber Ducks is a fantastic book for toddlers through elementary school readers. Babies and younger toddlers will still enjoy looking at the pictures, but the book is best used to teach additional lessons about the concepts it presents. I plan to read the book to my baby more often once she gets older. The hardcover version of 10 Little Rubber Ducks costs (including shipping) under $15 new and under $5 used from Amazon. While no longer in print, the board book is still available used for under $16 and an out of print paperback version is offered used as well.